We’re delighted to share the first photos of the cast from our summer plays! The photo above (by Ken Holmes) is from our production of The Merry Wives of Windsor, directed by Daniel Wood. Sir John Falstaff (Paul Shapiro at center) thinks he’s making progress with Mistress Page (Erin Day, left) and Mistress Ford (Nicole Vernon) in his quest to marry a rich woman in Windsor. SPOILER ALERT: He’s just going to end up in the dirty clothes hamper. Ken Holmes is directing our Backyard Bard productions of Pericles and Twelfth Night. 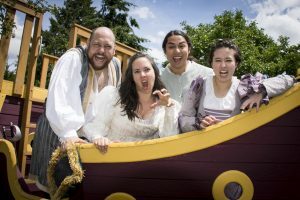 As both shows involve shipwrecks, it was fitting that the cast gathered for some photos in a real-live pirate ship in Ken’s backyard. Truly Backyard Bard! Gavin McLean, Jennifer Crooks, Tyler Dobies, and Laura Lee Caudill play all of the characters in both plays! You’ll love them! We’ll have some pics from Cymbeline, directed by Vince Brady, in the next day or two.